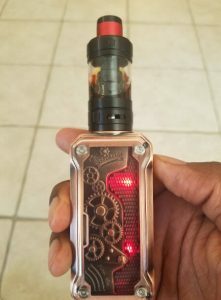 The Tesla Punk Mini is a stunning mod. If the characters in Mad Max were to vape, they'd be using this mod. This mod features variable wattage, temperature control, and a centered 510 pin which allows you to put on some pretty big tanks without overhang. It runs on a single 18650 battery and has a simple 3-button interface. One of the things that makes this mod stand out are the LEDs that are inside the mod. You can cycle the LEDs between several different colors. While this is by no means a perfect mod, Tesla did do a lot of things right with this mod. The look, the feel, the LEDs, the chipset, and the centered 510 to name a few. The design of this mod is my favorite thing about it. 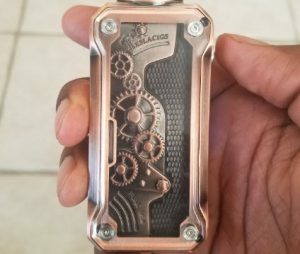 If you like steampunk, Tesla's chipset, and are in the market for a new mod, this is one you should strongly consider. 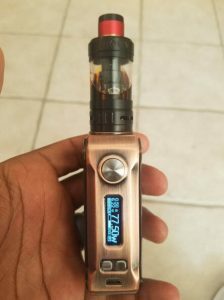 Order the Tesla Punk Mini 85W from a US vape shop. You're going to either love or hate the design of the Punk Mini. It's super stylish, but style is opinionated. In my opinion, it's a head turner and a conversation piece. People will be jerking their heads around as you walk by with this mod. The clear panels allow you to see the gears and lets the LEDs shine through. I like the “antique copper” color the best, but the “antique brass” is a close super second in my opinion. It comes in four colors total, copper, brass, black (looks more like gun metal), and 7-color rainbow. The Punk Mini is a pretty small mod since it only takes a single 18650 battery. It's a nice change of pace from the triple 20700 mod I've been using a lot. The Punk Mini feels natural in my hand. I don't have to contort my hand in any weird ways to accommodate it. One of the first things you'll notice when holding this mod is the build quality. It's phenomenal! But I have to say, the durable build quality does contribute considerably to the weight. This is not a light mod for a single 18650. One of the most impressive parts of the Punk Mini's performance is the quick ramp up time. The mod fires nearly instantly after pressing the fire button. Some mods can take up to a second before the coil starts firing. The delay in firing this mod is almost imperceptible. I wouldn't buy a mod specifically because of the ramp up time, but it would definitely play a role in my decision. The ramp up time for this mod is a pro in my book. This mod has been a reliable performer for me. It fires consistently and the hits feel the same, until the battery gets low. Once the battery gets too low, you will feel it taper off a bit. Being a single 18650 mod, the battery gets low quicker than I'd like. But that's the price you pay to shave off some weight and have a smaller device. The temp control (TC) suite is versatile and smooth. You can adjust the wattage while in TC mode, and there's also a TCR mode. Overall, I'm impressed by the performance of the Tesla Punk Mini. It performs much like it's predecessor. If you like the way Tesla's chipset fires, then you will like this mod too. If you've never used a Tesla mod, you're in for a good experience. During the first couple months of this mods existence, it was extremely hard to come buy. You could only find it on random vape shops mostly overseas. It was virtually impossible to pickup locally. Fortunately, it can now be purchased within the US which makes shipping a lot faster and supports US businesses. Mods that ship from overseas can take several long weeks to arrive in your mailbox. My favorite thing about this mod is the design and build quality. Other than the design, my favorite thing is the user interface. It's just so easy to use. If you're not used to how these devices usually work, then this would be an excellent introductory vape. The interface is painless, one of the easiest to operate in the business. Other devices require a bit of a learning curve. This one is pretty intuitive to use. Another thing I really like is how quick it fires. It's basically instant. The mods with the big lag time can get annoying, especially when you're sucking up air for half a second because you forgot about the delay. I'm glad this mod is a quick hitter. The Tesla Punk Mini 85W is a solid device. There's not much I would change about it other than adding a puff counter to the screen. It's a nice change of pace from the gargantuan three and four cell mods. The LEDs are a cool feature, but aren't for everyone. The good thing is, you can turn them off if you get sick of them. I like how feature packed this mod is. 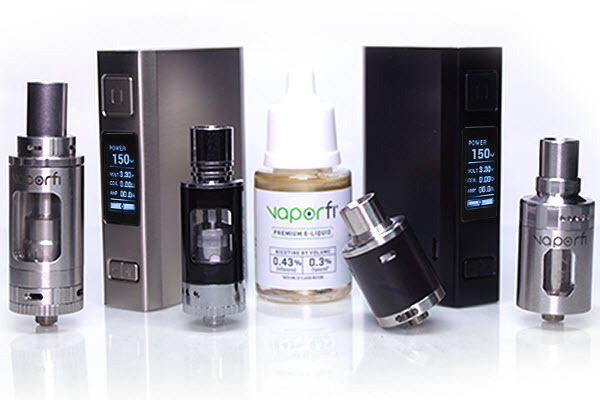 It has a full temperature control suite and has custom wattage curve functionality. It's solid all around. The build quality is exceptional. It's a really well built piece of hardware. 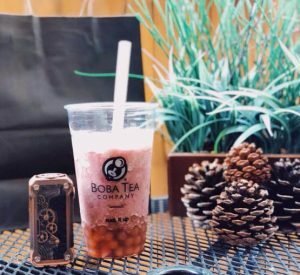 It's nice and small and fits nicely in your hand. This is a good mod for anyone who likes to vape in the lower wattage range (me) and doesn't want to carry around a brick mod. The punk mini performs like a pro and would made a good daily driver. Best of all, you can now buy the Tesla Punk Mini within the US.